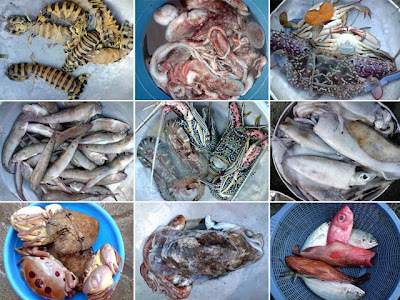 There are many places to get fresh seafood here in the country. In a lot of coastal towns, there are a lot of small markets where you can find some of the freshest catch of the day. While in Calatagan, Batangas, we dropped by the Gulod Morning Market. Located along a street corner along the National Highway in Barangay Gulod, you could easily miss it since it's quite unassuming, just a few vendors with some tables and containers (or palanggana) arranged on the shoulder of the road. But when you investigate it closer, you'll realize it has a great variety of seafood at very affordable prices, including a good number of crustaceans rarely seen in Manila markets. They usually open at 5 a.m. and are gone by 8 a.m. Fishermen literally drop their catch here before proceeding to the main market in town. Which is why the stuff on sale was still moving when we got there. Anything that's unsold gets sold in the town market. So if you want more choices, it's best to wake up early and proceed there. I'm sure there are small makeshift markets similar to these all over the country that sell the catch of the day. 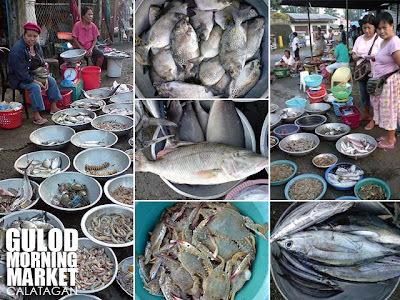 Check out Seafood binge in Capiz for another place to get really affordable seafood. 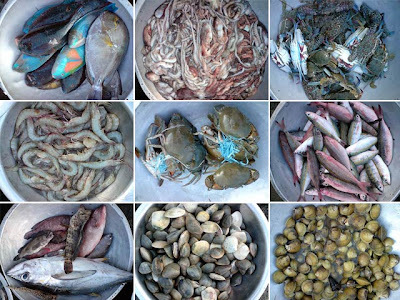 Do you know of any other places with these morning seafood markets? Masarap talaga ang fresh fishes. Lalo na ngayon ay nasa khobar eastern region ng suadi at malapit sa dagat. i use to watch our kababayan catching fish. fortunately na biyayaan ako ng malaking queen fish. Sana maalagan ang karagatan natin para pati ang susunod na henerasyon ay makinabang. have a nice day bro! This really interesting post showcasing Bstangas, aside from beaches!